Chinatown might soon be the site of yet another high-end condominium development. The Beedie Group wants to build a 13-storey condo tower at 105 Keefer Street, at the intersection of Columbia and Keefer. If approved, community organizers fear that the tower’s 127 market rate units will add to the displacement pressures currently facing Chinatown. This latest development proposal comes in the midst of an unprecedented level of condo development in Chinatown. In 2015, 427 condos and 298 market rental units are either approved, proposed, or under construction in or near Chinatown. As new condos continue to increase land values, rents in several privately-owned SRO hotels in the surrounding area of the proposed tower are likely to increase, pushing out low-income residents. Yet, when the Beedie Group initially submitted their rezoning proposal one year ago this month, there was no plan to build any units of social housing, let alone any affordable rental housing units. City council has no zoning regulations in Chinatown requiring developers to build social housing as part of new developments. Previous protections for Chinatown were reversed by city council in 2011, against strong opposition from the community. As a result, the overall ratio of condo/market units to social units being built is 69 to 1 in Chinatown according to research by Carnegie Community Action Project (CCAP). The HAHR was pushed through by the Vision-led council in 2011 and meant an overall rezoning of Chinatown, as well as additional height increases for a cluster of new developments in the area (See map of rezoned area). 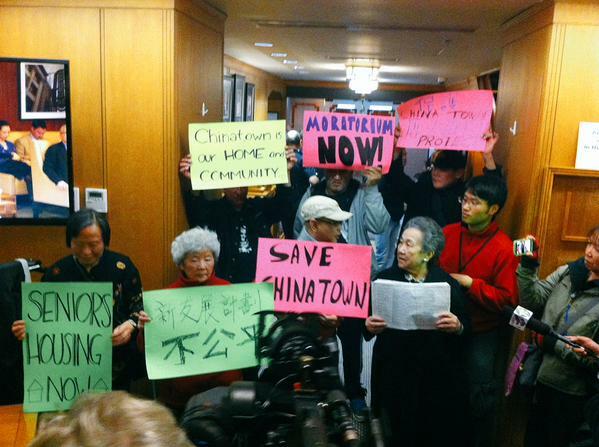 The height increase was a green light for the large-scale gentrification of Chinatown and it was pushed through despite organized and persistent opposition from hundreds of low-income Chinatown and DTES residents. Due to the public backlash, the public hearing for 105 Keefer initially scheduled for spring 2015 was postponed, and the developer has now submitted a new and revised rezoning proposal. The new revised proposal includes 25 “non-market” housing units, representing 16% of the total number of units. The non-market housing would be operated by the housing society SUCCESS, “underwritten” (financed through loans) by BC Housing, and designated for Chinese seniors. Yet, when a delegation from Carnegie Community Action Project (CCAP) meet with the developer on September 10th, it was unclear if any of the non-market units would rent at welfare rate. Looking at the precedent set by similar social mix developments in the area, it is likely that any low-income tenants will be expected to qualify for SAFER grants to afford the rents. The proposed site is located just across from the East entrance to the Sun Yat Sen gardens and next to an important monument commemorating the efforts and lives of the Chinese who built the Canadian Pacific Railway from 1881-1885 and fought in WWII from 1939-45. The Chinatown Concern Group wants a community centre built on the site that serves the working class Chinese community and promotes Chinatown as a thriving affordable neighbourhood. They also want to see seniors’ housing built on top of this future community centre. A community open house for 105 Keefer is scheduled from 5:00-8:00pm on Tuesday, October 6, 2015 at the Chinese Cultural Centre Auditorium (50 East Pender Street). CCAP and a coalition of Chinatown youth organizers including the Youth Collaborative for Chinatown is holding an Alternative Open House from 3–5pm at 105 Keefer, where you can share your concerns about the impact of this development and to build a collective vision for this site and for Chinatown. At 5pm, Chinese seniors and youth together with DTES residents will walk from 105 Keefer over to the City’s Open House (50 E Pender) in collective opposition. Posted in Chinatown, Gentrification. Bookmark the permalink. Despicable that the landgrubbing developers do not have a sense of SOCIAL responsibility. Dispicable that Vision Council only pays lip service to SOCIAL RESPONSIBILITY!